Bungie’s phenomenally successful Destiny 2 has grown immensely since it’s Forsaken Update September 2018. Combining the most perfect elements of a first-person shooter and loot-driven RPG experience, it’s hybrid masterpiece. Whether your platform of choice is the PlayStation 4, Xbox One, or PC, we’ve got all the Destiny 2 CD keys you need, from the vanilla game to its periodic expansions. Buy Destiny 2 CD Keys and take back Earth! Spanning more platforms than ever, Destiny 2 is no longer a console exclusive, and it has joined the ranks of the PC master race! Blizzard enters the fray and publishes the game on PC through its dedicated Battle.net service. Get a Destiny 2 CD key today - whether it’s for the base game, or for its expansions Curse of Osiris, Warmind, or Forsaken, we have it all. There are also CD keys for pre-order bonuses with limited edition emotes, sparrows, and ships. 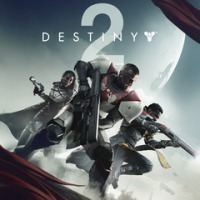 Buying the Destiny 2 CD Key for you is convenient and easy here at PlayerAuctions. You are protected by our industry-defining PlayerGuardian system, and our 24/7 support team is ready to assist you. - Contact your seller using the built-in on-site messenger at PlayerAuctions — it’s fast and easy! Conquer heroic activities like the Nightfall and Blind Well, and rise to the challenge of the game’s difficult raids including Leviathan and The Last Wish. On your way to becoming Legend, you will collect powerful Exotic Weapons such as the One Thousand Voices, Malfeasance, or the Sleeper Simulant which will even your odds against the Fallen, Hive, Vex, Cabal, Taken, and Scorn. Take it casually on Crucible Quickplay and do battle against your fellow Guardians all over the world in a silky-smooth PVP experience. Join thousands of players today battling the forces of Darkness in Destiny 2, and experience a space sci-fi adventure unlike any other.